When it comes to building an awesome battle station that you’ll love for a long time, you’re going to need to find the perfect gaming desk that fits your style. One factor to note is the amount of space you have, so you can fit the right desk in your room. Not all desks are created equal, and some will have different looks, heights, size, and features. Not all big gaming desks are the best. That also means that there’s more room for clutter, so having understanding better desk organization will also play a big role in your deciding factor. On the contrary, bigger also means more comfort in playing your favorite games. Still, your gaming desk has to fit into your room, meaning you can’t just buy the biggest desk you come across. The market is packed with different gaming desks, and we made a selection of the best ones based on ergonomics, size, aesthetics, and cool factor. Below are some of the top choices in 2019 that is perfect for almost all video gamers. Rated in no particular order. Scroll to the bottom to see our best gaming desk picks. 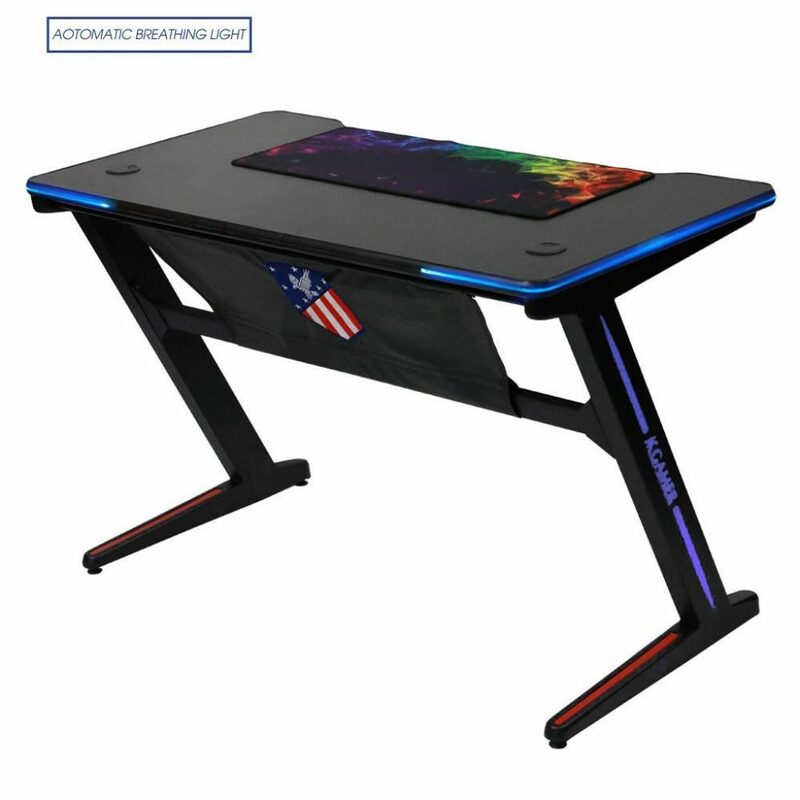 This is considered one of the best gaming desks on the market and is specially designed for all enthusiastic gamers and their gaming needs. The durable steel construction and charcoal carbon fiber laminated top make the desk sleek and easy to fit in any interior. With so many features that make it easy to keep clutter factor at the minimum, your desk space will always be clean. The overall ergonomic design makes it an efficient and sophisticated gaming desk. The desktop is curved for close-ups and comfort. Its monitor stand is elevated and supports monitors up to 32’’. It’s rich with many useful features that allow you to free up your desk space, such as a hook for your favorite gaming headset. Pair this table with the Herman Miller Aeron (shown in picture). Check out our review on this chair! Do you want a desk that looks sleek and modern but is still functional and efficient? The Arozzi Arena gaming computer desk is great for multiple monitors and may be one of the best options in this case. If you’re not interested in the Atlantic Pro, and need something larger, then this would be our second best gaming desk pick. Two large 27″ monitors such as the ASUS Rog Swift or Acer Predator can easily fit on this gaming table as it allows for multiple large monitors since it’s about 5’3’’ (160cm) wide. The 2’7½’’ depth provides a big play field for your keyboard, mouse and many other gadgets and devices. Its load capacity is 176 lb when it’s evenly distributed. What’s great is that this desk comes in many attractive colors. It allows you to adjust the feet of the desk to stabilize it. The desktop and the frame split into three sections for easy transport. The desk allows for height adjustment by just loosening the screws. It has three cable management cutouts for better organization. Plus, the microfiber cloth surface provides comfort and makes the whole desk a mousepad. 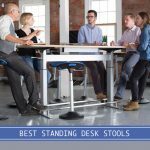 Looking for a similar style, but want one that can electrically convert from sitting to standing? The ApexDesk Elite is the perfect option. Check out the ApexDesk Elite from Amazon. 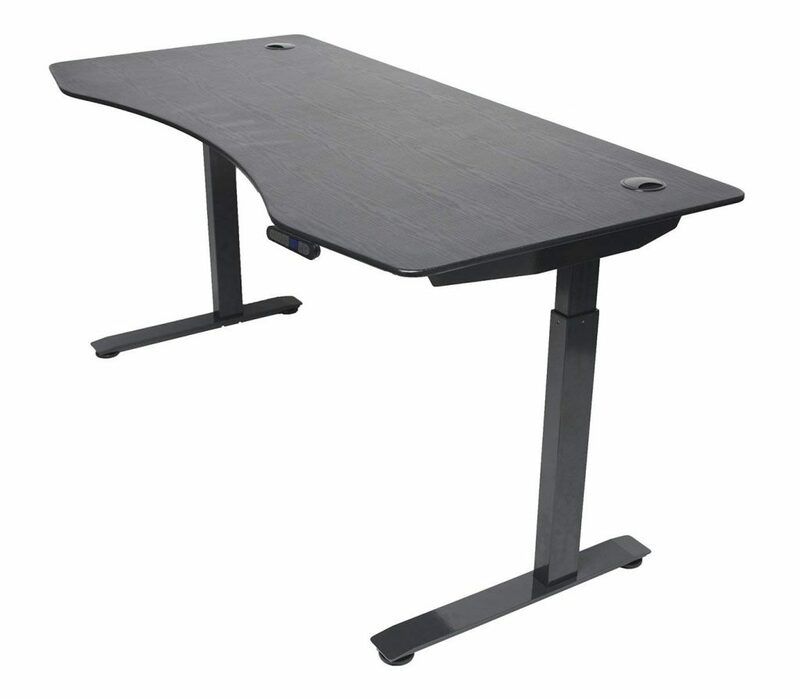 The Eureka Ergonomic Gaming Desk is a very sturdy and very affordable gaming table. The quality of this exceeds our expectations. We really enjoy the style from this gaming desk as well as the additional cup holder, headphone hanger, and console holders. This gaming desk is large where you’ll be able to have multiple monitors. Or like the image above, the desk is sturdy enough so you can mount a monitor arm without damaging the desk. The surface area on the table is large enough for anything else you need to help with your gaming experience. Eureka was also nice enough to provide a large mouse pad added to this gaming desk. We also like the fact that this desk comes with LED lights so you’ll be immersed in your gaming throughout your session. 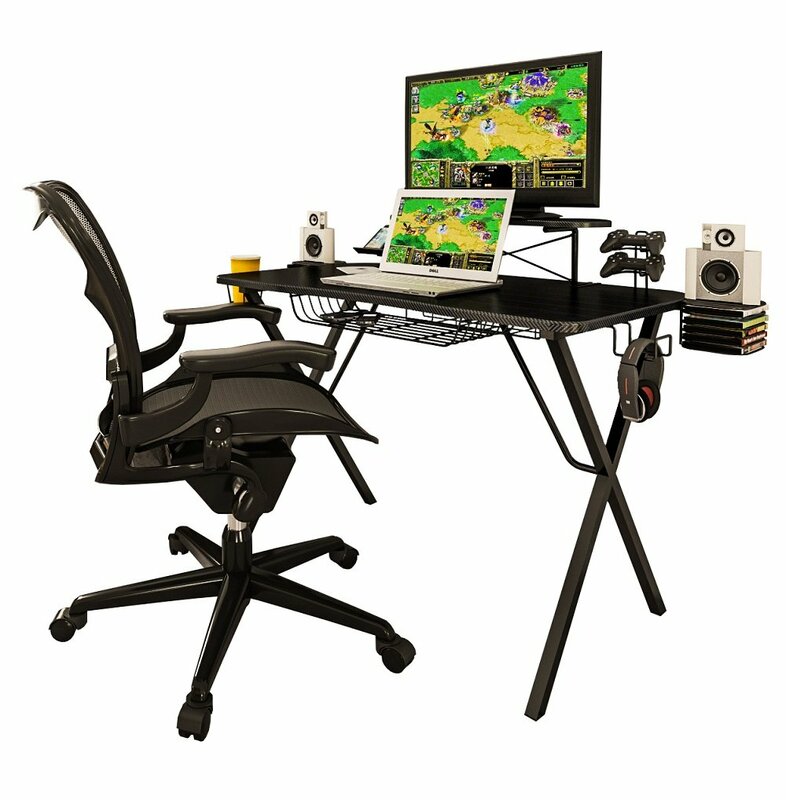 If you’re one of those gamers with a lot of heavy equipment, then this Kinsal is the perfect gaming table for you. With its capacity of up to 550 lbs, this sturdy gaming desk can handle anything heavy! 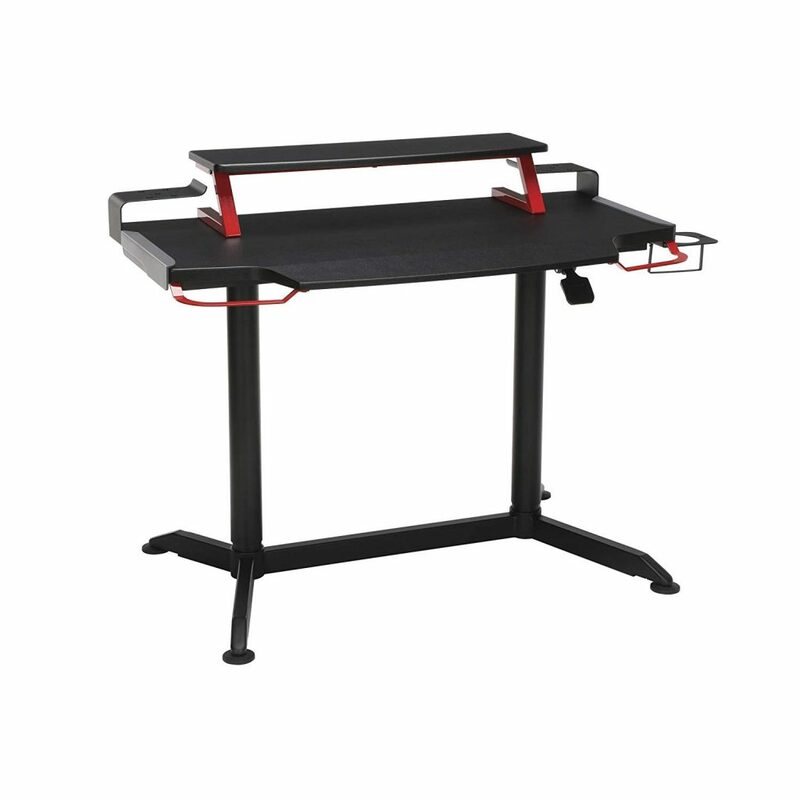 Its sturdy frame makes the desk super durable, with cool carbon fiber pattern. The desk is easy to install. It has cool ambiance lighting making it stylish and fun. The fact that it’s made of steel and solid material gives the desk a stable structure during long-hour gaming sessions. 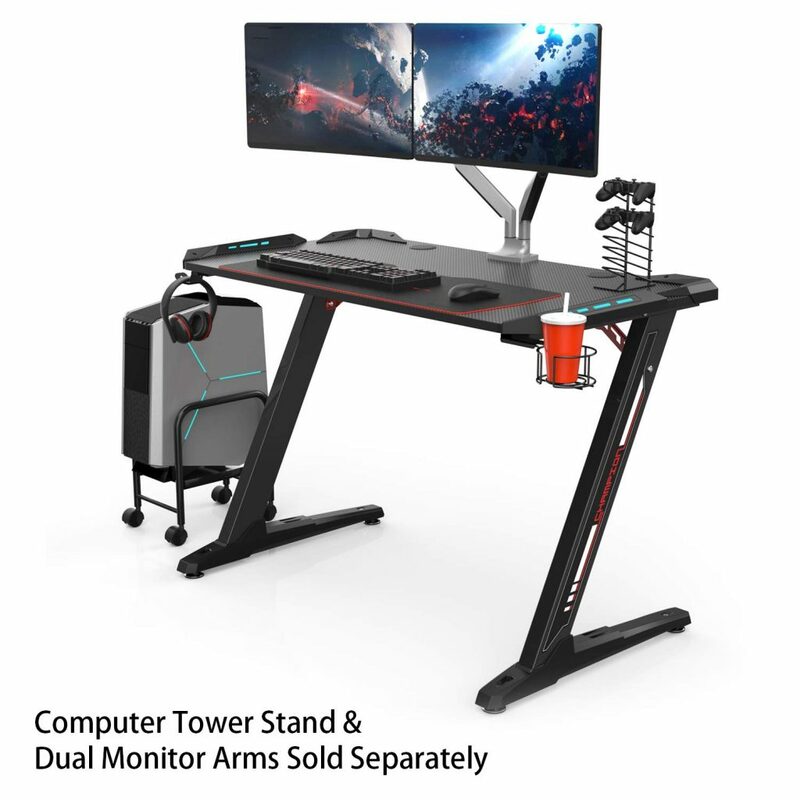 This is one of the ultimate gamers desk that is great for people who want to sit-to-stand or vice versa to get your blood flowing. The Respawn gaming station is built to last you for a very long time. The desk raises from 28.125″ to 43.875″ high. When you feel like you’re being sluggish, you can simply use the easy lever to raise the gaming table from typical standard desk height to standing position. Respawn has also built this desk with ergonomics in mind. With the shelves, the monitor can be at eye level, so you don’t have to worry about neck cramps. One thing that may bother some people is the size of the table. 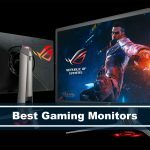 You’ll have to keep in mind how you want to set up your gaming monitors. If you want dual monitors, you may need to get a monitor arm or find monitors that can fit 28.75″ L x 8.625″ D shelf. With its double triangle design, the DXRacer is one of the best gaming computer desks on the market. It’s strong, reliable and durable. The 10-degree slope gives you the best ergonomic angle for your forearm. This feature, combined with the extended work surface support your arm when you’re gaming or writing. The desk is quite stable by construction thanks to the double triangle design. Plus, it has openings for all your wires and cables. It’s large, rotatable, and has trapezoid feet. This means you can easily move the desk around without damaging your floor. With the raised perimeter, all your stuff will remain on the desk. The DXRacer comes in green and red, and it’s made of wood and steel for the frame. Its overall size is 47.30’’ x 31.50’’ x 31.50’’. It recommended to most serious gamers who spend a lot of time on their computers because it has an ergonomic design and it supports your forearm. If you want ergonomic design and aesthetics, this desk is what you’re looking for since it’s inspired by science fiction. The steel rods and a helmet covering design make the desk unique and sleek. The arch desktop gives multi-point supporting along with comfortable gaming experience. The desk features cold blue LED lights and wire wrapper for cable management. The Modrine did about 600 tests until they came up with the design that absorbs shock and protects the desk from damage. It measures 48 x 26 x 30 inches plus the 25mm thick desktop. Its load capacity is 880lb, which is more than most desks can handle. Made of wood and classy, waterproof coating, the desk is durable and made to last you a lifetime. It’s comfortable and convenient while its attractive design will transform your office or dorm room into gaming heaven. If you like the gaming chair, in the picture, check out the best DXRacer gaming chairs reviews. The ApexDesk Elite is a very similar shape to the Arozzi gaming desk, but with one caveat. This desk has the ability to switch from a sitting position to a standing position. The ApexDesk is electric powered and gets you from sit-to-stand with a press of a button. If you’re not the one to hit the gym or weights, then this can at least get your blood flowing and burn some calories while gaming. ApexDesk also designed the desk to keep your table clean from wires, giving you the ability to easily manage your wire from all your computer equipment. This very simple and solid L-shaped desk, great for any corner desk setup. 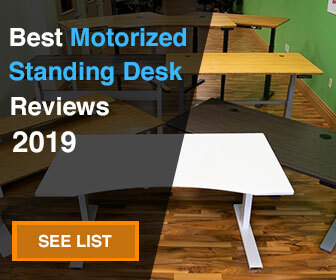 A lot of customers have vouched for this desk, making it to our list of best gaming desks on the market for 2019. 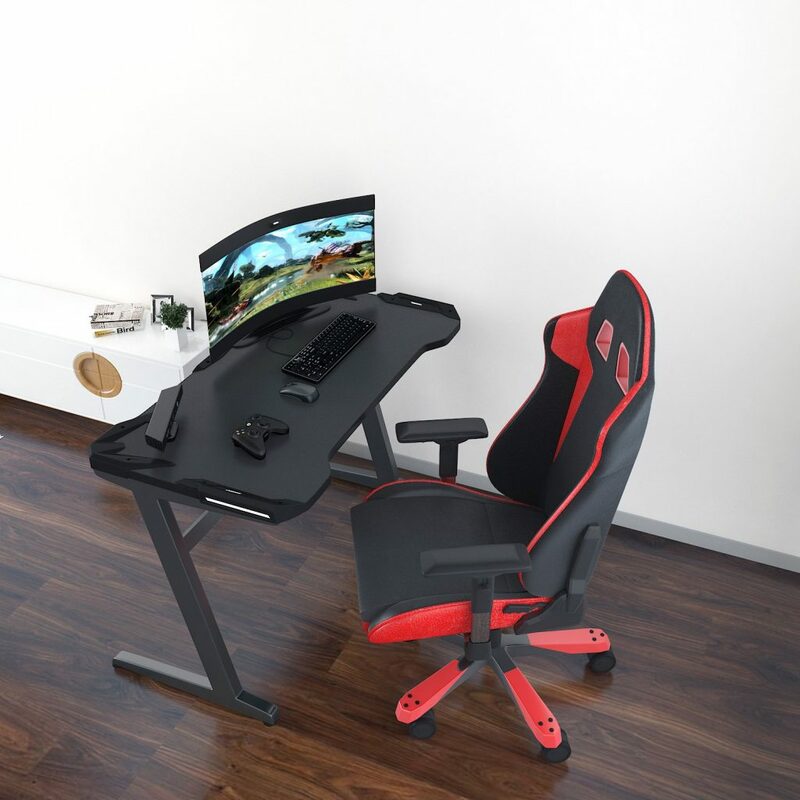 Because of the way this desk is shaped, you’ll be able to put more than just two monitors, perhaps three, even, to get the full gaming experience. This desk is great for those that want to use the desk as both an office and gaming. Because it doesn’t have all the bells and whistles of a true gaming desk, this one still a great product because of its design features, size, and construction. The Mr Ironstone L-Shaped desk is great for those that don’t have too much space but still want a large surface area for their gaming rigs. Another L-Shaped desk for those that want the bulkier look of a gaming desk. This is a special gaming desk because its made of steel framing so it can withstand any heavy loads you put on this beast. The desk also has a keyboard tray for ergonomic purposes. This table is 65″ in length (longest side), but approximately 55″ in length (shortest side), so you can adjust your desk per your room’s capability spacing. 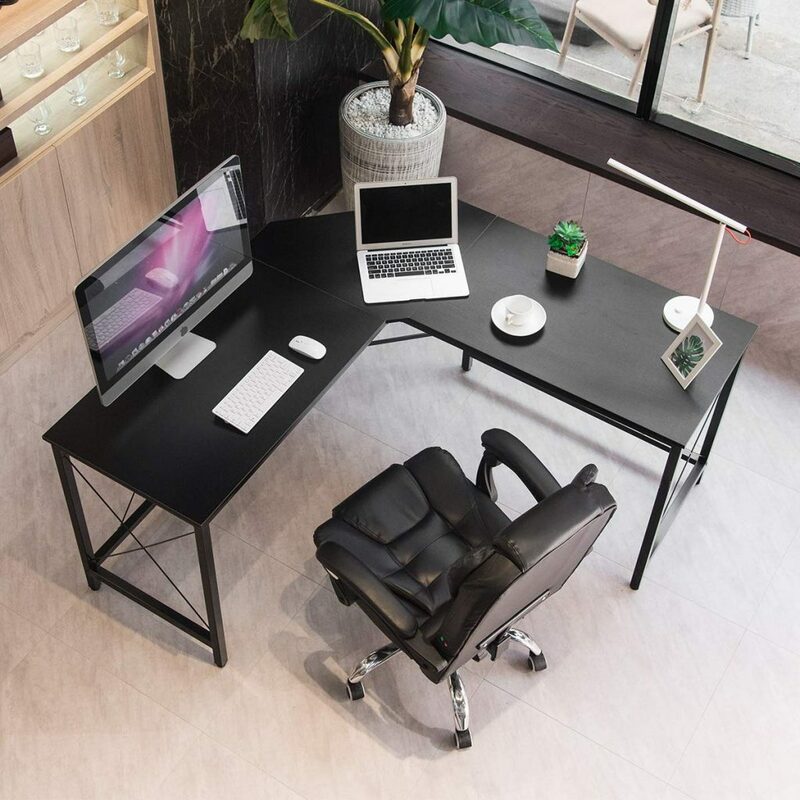 This L-shaped desk is stylish and can pair greatly with your LED lights. With the glass top, your lights will shine bright and reflect throughout your room. How did we rate our gaming desk? These are some of the criteria we look for when we were going through our list of gaming desks. We took into consideration the type of features our gamers would need to keep them satisfied while playing their favorite games. In addition to the above list of criteria we used for rating the best gaming desk, we want to explain some additional features we look for. Because ergonomics is a big factor for Desk Advisor, we decided that this would be important to consider when looking for a gaming desk. If it’s ergonomically designed, your desk will help achieve the ultimate computer gaming experience. Look for desks that are made to be comfortable, allow you to pull closer to the desktop, and have forearm support. Those are only a few ergonomic features to pay attention to when buying a computer gaming desk. Size is also important but can vary and depends on your preference. First and foremost, consider the size of your room and how much space you have for your desk. Luckily, there are different sizes on the market, from the smallest to the largest. You can also choose from many different models regarding shape. Usually, ergonomically designed desks have a unique shape that contributes to the overall comfort. Your desk board should be clean and clutter-free. To achieve that, it’s important that your desk has wire management and storage compartments. This way, you can put away all the stuff that you don’t use at the moment but might need later. Luckily, most desks feature wire management, so those cables don’t end up tangled all over your room. Computer gaming desks usually have something very science fiction about them. This style and sleek lines make the desk appear very aesthetic. Aesthetic desks are usually Z-shaped and have some lighting effects for the ultimate experience. Standard Gaming Desks – These are the typical favorite gaming desk you’ll see amongst many gamers. 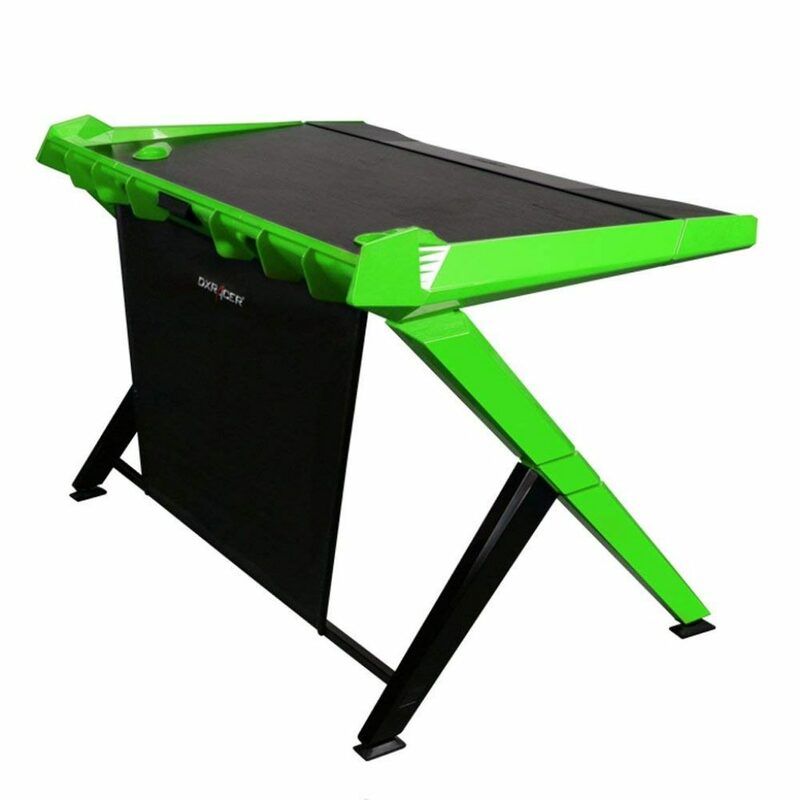 Standing Gaming Desks – These can help transform your sitting position to standing position. Because standing is good for blood flow, it can help make you more focused on your gameplay. When you’re tired, you can easily switch from sit to stand. 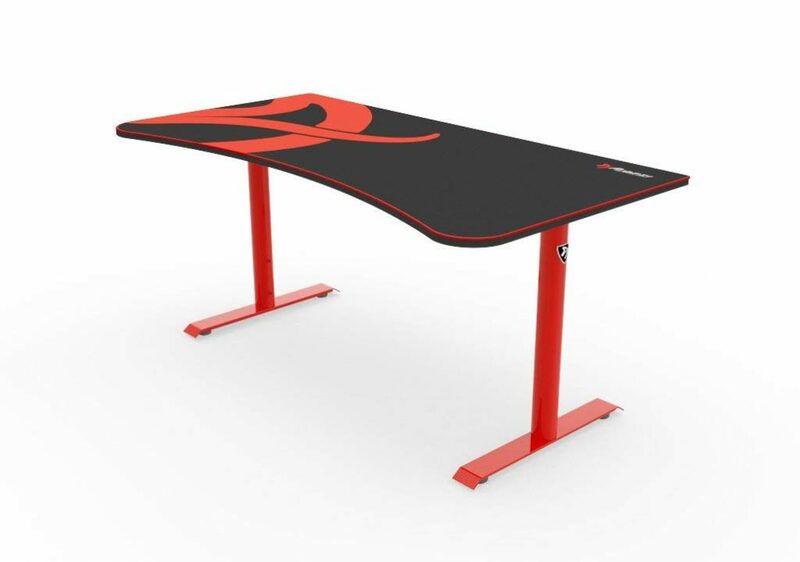 Z-Shaped Gaming Desk – These are gaining popularity in the gaming community. It adds a flare of gaming design to your desk. Most of these Z-Shaped gaming desks also come with lights. Multi-Tiered Desks – These help aid in the ergonomic of keeping your monitor above your keyboard. In addition, it is a great space saver too. 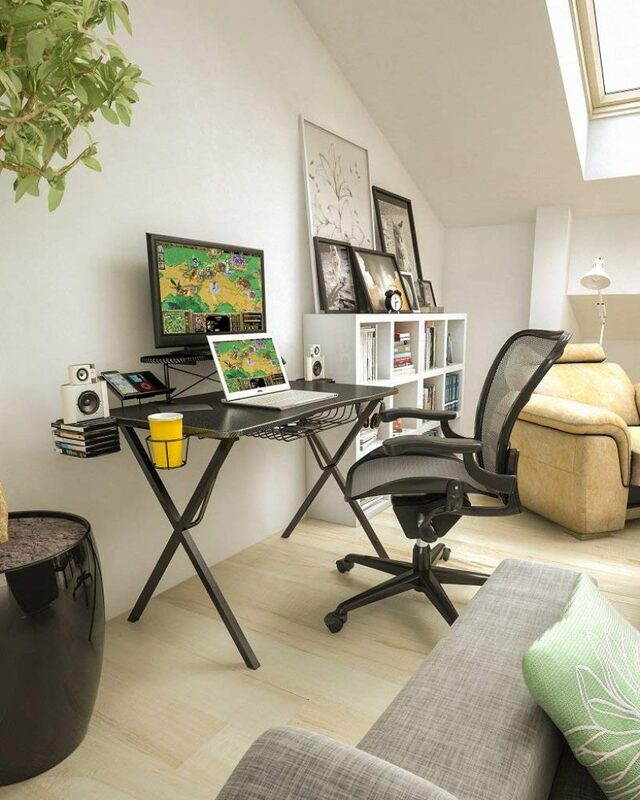 Corner Desks – Also known as L-Shaped desk, which helps with keeping space in mind for your gaming area. These are typically good use if you want to keep one side for gaming and then another for being productive. Can I use my executive desk as a gaming station? Although there’s no real rule as to which desk you would want to use as a gaming desk, we think that an executive desk should be kept clean and be used only for your professional work. 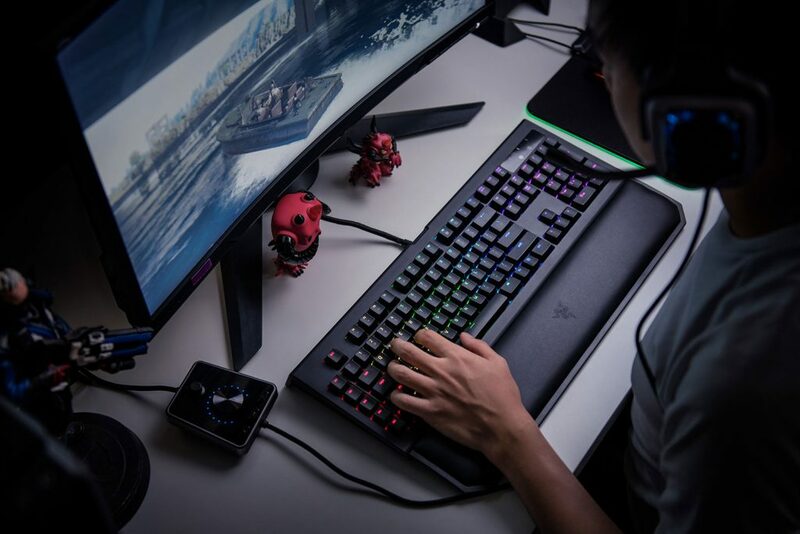 However, if you want to play games on your executive desk, perhaps getting a gaming laptop would be the best option and have your gaming laptop accessories stored away when you’re working. This way, you’ll be less distracted whenever you actually need to focus, but also an arm’s length away when you want to get into the gaming groove of things. Are standing desks good for gaming desk setup? When it comes to gaming, you’re often sitting down for long periods of time. There have been studies that sitting for a long time can cause long term health issues. Getting a standing desk for gaming is a great idea. When you’re standing up, you’re getting a lot of health benefits including blood flow throughout your body. At the same time, you’ll be more alert when you’re standing up, providing you with more focus throughout your gaming sessions. How wide should my gaming desk be? Gaming setups come in various sizes. If you’re looking for a multi-monitor setup, then you’ll want a wider desk. We’ve seen setups where gamers have two 34″ monitors, where the Arozzi modern desk would work perfectly, or if you’re only in need of one monitor, then the Atlantic Pro is a great option as its stylish and has a lot of features. Why are a lot of gaming desks Z-Shaped? This shape gives it a more modern look. A lot of new styles have this type of Z-shaped legs for aesthetic reasons. When you’re building your gaming set up, you may want to think about whether you want a regular table or be different and get one that is Z-shaped. Can I use an L-Shaped desk as a gaming desk? I would say this would depend on how much space you need for your gaming set up. If you can only fit your desk at the corner, then an L-shaped desk would be very appropriate. However, this can vary depending on each person. Perhaps, you don’t want a lot of desk space, and you just want something compact that will only need to fit one monitor, which is an L-shaped wouldn’t be ideal. You’ll have to decide whether you need the extra desk space, or not. Do gaming desks increase gameplay abilities? The quick answer is yes, but it also depends on a few factors. Having the perfect gaming desk can aid you in mobility. These desks are designed for keyboards and mouse to be ergonomic while playing intense games. This helps with lots of angles that you’ll need to move around and be agile. Pairing a gaming desk with the right monitor, chair, and perhaps headset or speakers can add an additional gaming experience. There are literally hundreds of gaming desk options that you can choose from. We picked out the best ones from the top sellers and that is highly rated. Of course, everyone’s taste is different, so we suggest you take this review with a grain of salt. These desks are perfect for any gamer, from a compact desk with multiple storages, to standing desks, we feel that we’ve covered the majority of the best gaming desks on the market. If you decide to choose any of our desks listed, we would love to hear your experience and how your new gaming set up looks like! Also, don’t hesitate to ask any questions in our comment box below!